We have a team of experienced chefs at your disposal to give every event that extra something special. All our chefs trained at top London Michelin star hotels and under the direction of our head chef Stuart Conibear they will ensure that your chosen menu is produced and delivered to the highest standard. Having attended many public and private functions in the past dishing out unimaginative 1970’s fare, Sally soon realised there was an opportunity for a new initiative when she launched her first catering enterprise in 1981, very soon gaining a well earned reputation for flare, quality and first class service. Sally and her loyal team were soon in very high demand as along with everyday commitments to her private clients she was also handling corporate hospitality for Northampton Saints Rugby Club and centenary civic celebration events for the town hall. Sally’s reputation was spreading fast, culminating in being asked to be personal chef to the Spencer family at Althorp House Northamptonshire during the tenure of the late Earl Spencer and Countess Raine Spencer. This also coincided with the period when Lady Diana Spencer regularly escaped to Althorp from London during the time of her engagement and subsequent marriage to Prince Charles. Sally has many treasured memories of Diana during their occasional private moments together. Sally eventually moved on from Althorp to concentrate on her catering business, although she was frequently asked back to lend her expertise during busy periods. Having continued to produce catering of the highest standard from her kitchens in Northampton, in 1998 she was joined by her husband Jerry and The Austin Fell Partnership was born. Through their joint efforts the business has gone from strength to strength and can be regarded as one of the premier event caterers for Northamptonshire and adjoining counties with also a strong presence in the home counties. The success of the business is primarily down to the vision and hard work of Sally who has made it her personal goal to ensure that all her customers whether it be a wedding party or a corporate event are made to feel that they are in safe hands from the initial meeting through to last dance. Sally’s watchwords are, attention to detail, the personal touch and with great emphasis on remembering that the client always comes first. With over thirteen years of culinary experience to call on, ranging from top London Michelin starred hotels and more recently as Head Chef to the Royal Household, Stuart is key to the ongoing success of The Austin Fell Partnership. 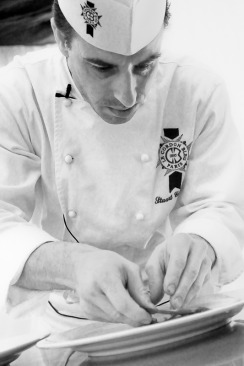 In 2013 Stuart was Elior Chef Of The Year Winner and in 2014 he was La Parade De Chefs Silver Medallist. Being a natural leader Stuart’s skill is in running the back of house operation, quietly and efficiently with his team of highly trained chefs. Under his guidance, his imaginative and innovative menus using only locally sourced and sustainable produce, ensures that all our clients leave with a feeling of satisfaction, in that they have experienced an event of the highest quality. Having spent most of his professional life in sales management Jerry joined forces with Sally in her catering business to help develop new markets and expand the business into different areas. The success of the business has been built on delivering a top quality product at competitive prices to the wedding market concentrating mainly on marquee events. The clientele is now very mixed, catering not just for weddings but also corporate events, private celebrations and even leavers balls for public schools involving up to five hundred guests. From his time spent in sales and marketing Jerry knows that every event is a team effort, every member of staff has to play their part to ensure that all Austin Fell Partnership events are remembered for the right reasons.